Invitations to all CAS meetings and events. You’ll get to meet top designers and luminaries from the audio world. Audition equipment and music not normally available from local audio salons and dealers. Exchange ideas with others sharing the same interests. 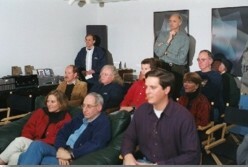 Attend meetings at local audio-related businesses. Our subscription year is from January 1 through December 31. All subscriptions are due on January 1 of each year and the membership fee is $40. Partial-year membership fees are pro-rated based on when you join; i.e, if you pay between April and June, your dues will be $30.00 for the remainder of the membership year (see the PayPal drop-down list below for details). We accept PayPal for online payments, or you may pay by check at any CAS event. Once we've received your payment, you will receive a confirming PayPal receipt. New members will receive a personalized greeting from our President. New members and existing members not registered on our website will receive an additional message with a special URL and registration key inviting you to do so. Please email us below if any of the above criteria haven't been met.